Dental Implants: Replace Your Missing Teeth. Forever. A dental implant is actually a small titanium post that is placed within the jaw to replicate the root structure of a lost tooth. After completing the placement procedure, you’ll be given a few months to heal before returning to our office to receive your new replacement teeth. Implant-retained crowns are used to restore single missing teeth, and they consist of three parts: the implant itself, an all-porcelain crown, and an abutment. 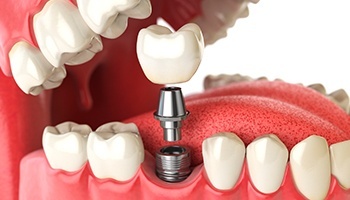 The crown will be connected to the implant using the abutment, and once this is done, this new tooth will be virtually indistinguishable from those surrounding it. 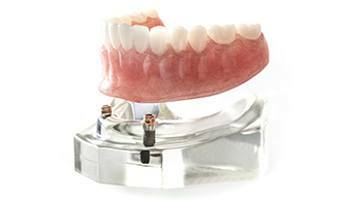 Have a denture that just won’t stay in place anymore? 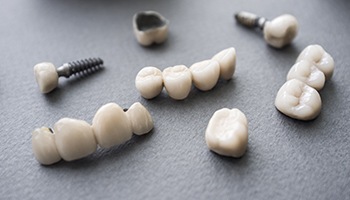 With dental implants, we can give you a denture that will fit better, maintain that fit longer, and give you a much stronger bite force compared to a traditional removable prosthetic. The denture itself will simply snap onto strategically placed implants positioned around your jaw, giving you the next best thing to nature. With the All-On-4 dental implant procedure, we can give a patient a full implant-supported denture in just one day. 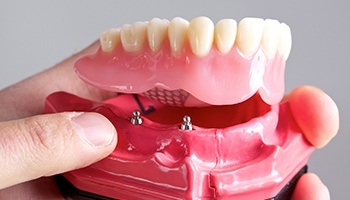 Four implants will be placed into the jaw, and then they will be immediately connected to the new denture. It’s one of the fastest ways to bring back a complete smile, and for most, their only regret is not getting it sooner.